This article first appeared in Personal Wealth, The Edge Malaysia Weekly, on March 18, 2019 - March 24, 2019. 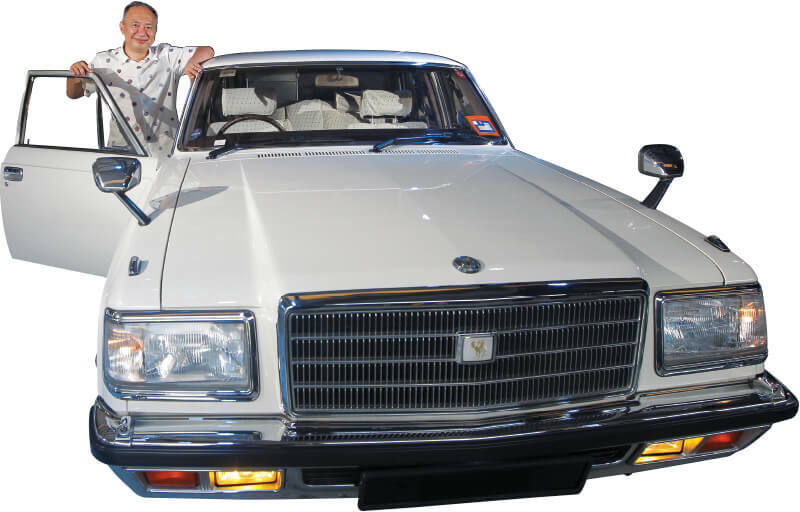 Ong posing with the 1991 Toyota Century V8 that he sourced for a client. There are reportedly fewer than five examples in Malaysia right now. The last 10 or so years have seen greater investor enthusiasm for vintage sports cars from Japan. Although the global market for vintage cars still heavily favours European and American brands, Japanese carmakers are increasingly finding their way into some of the most celebrated auction houses the world over. This emerging subclass of vintage cars is more accessible to younger and recently successful enthusiasts, without sacrificing value appreciation. The numbers tell a very encouraging story. Japanese performance cars have had a cult following for well over four decades now. But it is only in the last 10 years or so that they have consistently gone to auction. The cars are quickly snapped up and most of the prices consistently increase with each example that goes under the hammer (subject to quality). For example, the Datsun brand has become highly sought-after in recent years and now regularly finds its way to top auction houses. Broad data on conceptcarz.com show that 10 Datsun models sold in 2008 — the first time auction sales went into double figures. Enthusiasts have not looked back since, with the numbers steadily climbing and peaking at 42 last year. At the time of writing, 10 Datsuns have gone under the hammer in 2019 alone. More specifically, the 1973 Datsun 240Z has seen a spike in demand at North American auctions since 2016, with 13 cars going under the hammer during that period. For perspective, conceptcarz.com says only 16 cars were offered at North American auctions between 2002 and 2015. That said, a key feature of Japan’s global automotive dominance — the sheer production numbers — mean that Japanese sports cars will likely never command the eye-watering figures of a one-of-a-kind vintage Ferrari. It is true that Japanese sports cars may never reach the values of some of their Italian or British counterparts. On the flip side however, it means that some of the best and most ground-breaking sports cars in the world — vehicles that easily held their own against their illustrious European counterparts — are available as collectors’ items at far more forgiving prices. Consider the Datsun 240Z. A compact two-door Japanese sports car, Datsun’s “Z” badge is an icon of Japanese motorsport. The brand belongs to Nissan Motor Co Ltd, which created the Datsun brand to enter the lucrative US market. The first generation Datsun 240Z was released in the US market in 1969. It ticked all the boxes for American owners at a time when petrol prices were spiralling out of control and consumers could not afford large displacement, gas-guzzling muscle cars. “Back in Japan, the car was frequently depicted in comic books as an object of desire. And years later, it would be immortalised in international television shows, on the big screen and in video games. As the number of global enthusiasts grew, the ratio of these cars gradually dropped. Enthusiasts have been gradually collecting these cars before the best examples run out and are priced out of the market,” says Tan. Rarity will always be the overarching factor in a car’s value and this will keep values from skyrocketing in the foreseeable future. The most expensive Japanese sports car ever sold at auction — the indomitable 1967 Toyota 2000GT — went for nearly US$1.2 million in 2013. A bona fide rare classic, fewer than 400 models were ever produced. Its status as a legendary sports car and auction-house staple was further sealed when it appeared as a “Bond car” during Sean Connery’s turn as 007 in 1967’s You Only Live Twice. In contrast, a 1962 Ferrari 250 GTO fetched US$48.4 million at auction in August last year. To a large extent, the emergence of Japanese sports cars on the collectors’ circuit has coincided with the country’s incredibly successful export of its culture to the rest of the world. Old “anime” series such as the underground racing Initial D series, released as far back as the mid-1990s, still command an immense following the world over, Malaysia included. Sony’s famous PlayStation gaming console platform was also, for many years, synonymous with arguably the most successful racing simulator of all time: the Gran Turismo franchise, developed by Japanese studio Polyphony Digital. These cars were subsequently picked up and featured by Western media and game developers, further enhancing the collector’s appeal of many Japanese sports cars. The Hollywood blockbuster Fast and Furious movie franchise, for instance, has been instrumental in permanently cementing models such as the Nissan Skyline R34 GT-R, Toyota Supra Mk IV, the Mazda RX-7 and, of course, the 1970s Datsun 240Z in global popular culture. It also helped that legendary Hollywood actor Paul Newman — whose iconic Rolex Daytona Ref. 6238 became the most expensive watch ever sold at auction in 2017 — was an avid racer. A championship-winning driver himself, Newman maintained a years-long relationship with Datsun, racing a highly tuned 280ZX, among other models. The Datsun brand was available in Malaysia for many years, where the brand’s “Z” badge sports cars was very well received. Thanks to the large production volumes, it is still possible to see a handful of relatively untouched 240Z, 260Z and 280ZX examples in the country. Another issue to consider however, is that while the Japanese collector car market has been gaining significant ground in the US, it is still fairly nascent in Malaysia. This helps keep prices relatively low at the moment. On the other hand, it is likely that most local specimens are in various stages of disrepair. Investors looking to maximise their upside would need to weigh the possibility of a significant capital outlay before the car is in any shape to join the collector’s market. A best-case scenario for the enthusiast, of course, would be to acquire an unrestored specimen and get to the task of sprucing up the car with only original parts. “Generally, many classic cars suffer little to no depreciation. And right now, some owners see a 5% to 15% appreciation annually. The market for Datsun’s “Z” cars [the 240Z being the most venerable model right now] is gaining traction and we anticipate more aggressive returns in the future. This, of course, is subject to the quality and restoration work of each individual specimen,” says JTCars’ Tan. 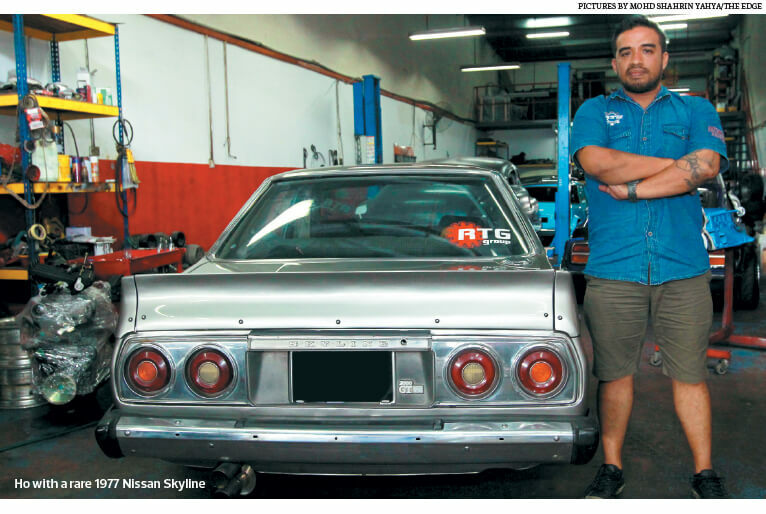 R-Tune Garage owner and proprietor Dwayne Ho advises enthusiasts to be very careful about adding non-standard, after-market modifications to a 240Z model. Collector cars generally command premiums only if they are as close to mint condition as possible. The Johor-based classic car restoration outfit has developed a reputation for masterful restorative works of old American muscle cars, a variety of European brands and, in particular, classic Japanese sports cars. “Having original spare parts and components in your car will have a huge effect on its value. Examples that come with after-market modifications or components that are cannibalised from other models or even other brands could easily suffer a 30% drop in value,” says Ho. “There are places from which enthusiasts can source original Datsun components. Japan is an obvious choice but Australia and, increasingly, New Zealand have large communities of 240Z enthusiasts. There is also a growing spare part and component manufacturing industry for classic Japanese cars in these countries. 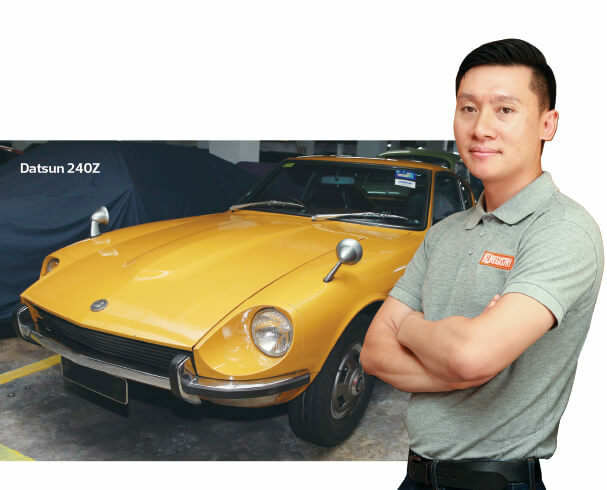 Ho concurs with Tan, saying that it is not unheard of for an early 1970s 240Z to command north of RM100,000 for a relatively clean example, to more than RM300,000 for a near-mint condition, showroom quality version. To capture as much of the appreciation as possible, enthusiasts should ideally not look at bottom of the barrel examples to restore. It can be tempting to look through the online classifieds and find seemingly clean examples for under RM40,000. The 240Z’s biggest problem is not always visible upon initial inspection, according to Ho. “Old cars — and the Datzun ‘Z’ cars are no exception — are prone to rust. A fully painted car may look nice enough and it is possible that the engine is in relatively decent shape. But basic restorative work — meaning body work, new coats of paint, some engine work and perhaps some suspension work — could easily set you back RM40,000 to RM60,000 to begin with,” he says. That said, the number of 240Z models still available for purchase is rapidly dwindling, despite its large production run back in the 1970s. “The number of cars available in Japan [a popular source for Malaysian collectors] is falling, at a time when collectors are increasingly seeking them out,” says Ho. With the internet, there has been greater price transparency for Datsun 240Z models throughout the world. In addition to increasing rarity, price transparency is another factor behind the rapid appreciation in value of this model, says Ho. Looking to the tail-end of the 1980s, Nissan once again revolutionised the global sports car market when it released the Nissan Skyline R32 GT-R in 1989. Unlike the Datsun 240Z, this car was never meant to be exported overseas. OKL Classic Automobiles Sdn Bhd proprietor Ong Kheng Liat says it was produced specifically for the Japanese domestic market, albeit with a limited run in Australia. Given the nickname “Godzilla”, these cars are highly sought-after the world over, particularly in the US market. 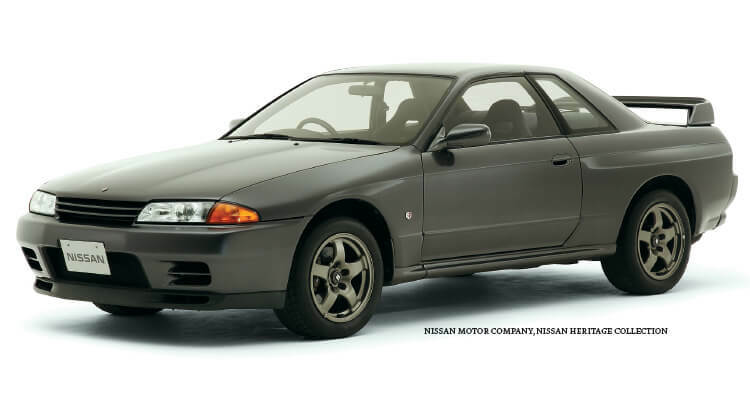 Low-mileage, rust-free models of the R32 GT-R would easily command a significant premium. The reason for this “North American premium”, as Ong calls it, is down to a peculiar legislation which banned the import of cars that were 25 years old or newer. As a result, it was only in 2014 that the R32 GT-R could be legally imported into the US. “What I have noticed is that whenever a classic Japanese sports car hits the 25-year mark, it tends to see a spike in interest from the US. Under the circumstances, it is possible for a Malaysian owner to sell a pristine, low-mileage example to a US buyer with a ‘North American premium’, up and over the usual asking price,” he says. Ong sourced a well-kept example from an Australian owner a few years ago, after being engaged by a local car collector. “This particular example cost my client more than RM200,000,” he says. In the US, the “North American premium” sees very clean examples regularly going for more than US$50,000, says Ong. In 2016, Sotheby’s sold an example with less than 14,000km on the odometer for US$82,500. Even so, these values are just for the baseline model R32 GT-R. Nissan produced a very special limited edition of the car in 1993/94. Dubbed the V-Spec, fewer than 1,500 cars rolled off the production line. These examples were the zenith of the R32 GT-R generation. Unfortunately, many were heavily modified by enthusiasts over the years and clean models do not appear to have hit major auction houses just yet. “It is very difficult to predict the value of classic Japanese cars as the overall collector’s scene is still new. But I personally think a mint-condition R32 GT-R V-Spec could go for as much as half a million ringgit, if not more,” says Ong. Owners will also be pleased to know that Nissan took notice of the global enthusiasm for the legendary R32 GT-R. In late 2017, the automaker announced that its in-house racing division, NISMO, had established a heritage parts programme to provide new restoration components for the car.